A time for reflectionChristmas should be a time of peace, togetherness and celebration; yet it can leave all too many of us feeling overwhelmed by loneliness, stress and worry. In This Light is a timely collection of thoughtful meditations. 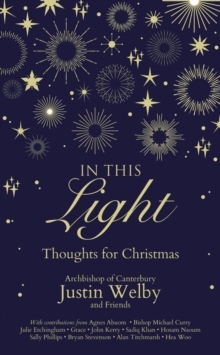 The Most Revd Justin Welby, Archbishop of Canterbury, leads contributions from celebrities, business leaders, athletes, politicians and others, whose names you might not know but whose stories you will come to love. Alan Titchmarsh, Sally Phillips, Bear Grylls, Afua Hirsch, Bishop Michael Curry, Secretary John Kerry, Dany Cotton, Elif Shafakand Sally Lloyd-Jones- among others - offer their thoughts and insights as we reflect on this time of year. In a world that often seems in turmoil, these personal essays invite us to remember and rejoice in the true, timeless spirit of Christmas.